Cooking with a cast iron skillet is about as old-fashioned as it gets. Back in the days before Teflon existed, cast iron was the original non-stick cookware because a well-seasoned cast iron skillet does a surprisingly good job of cooking food without having it stick. It’s also really convenient to be able to switch right from the stove top to the oven without having to transfer the food to another pan. If you’ve only ever used modern non-stick pans, though, switching to cast iron cookware can seem a little bit intimidating at first, or at least it was for me. 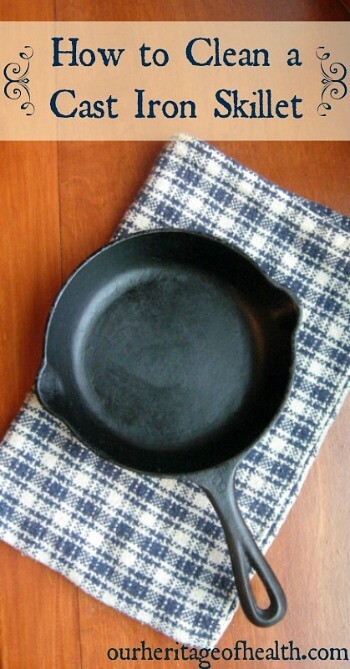 And the big question is, how to clean a cast iron skillet properly? You hear about all of the things you’re not supposed to do that might strip off the pan’s seasoning, and you end up being afraid to even use the pan because you’re so worried about ruining it. A well-seasoned cast iron skillet shouldn’t leave much food residue behind, but depending on what type of food you’re cooking, there might be a little bit stuck on the bottom or the sides of the pan. Using a spatula or even just a spoon, scrape off any residue. You can also sprinkle coarse salt into the pan as an abrasive and use a damp sponge to rub it around the pan. This step is important. You don’t want to let the pan sit with water in it for hours or it could start to rust, so simply wipe it dry with a dish cloth right after washing rather than letting it sit in the strainer with your other dishes. By wiping a thin layer of oil onto the dry pan, you can help to protect it from rusting and to build up additional layers of seasoning that will make the pan even more non-stick the more you use it. Lard is the traditional seasoning oil for cast iron and it’s most likely what your great-grandmother would have used for caring for her cast iron, but good-quality lard isn’t nearly as accessible these days as it would have been in the past. If you can find a source of good-quality organic lard from healthy, pasture-raised pigs, then that’s great, but if not, coconut oil works just as well and is a lot easier to find. I like to use this coconut oil for seasoning my cast iron. 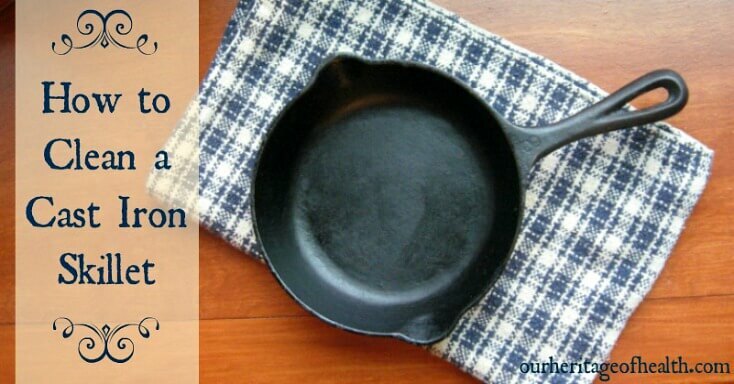 * The sooner you can wash your cast iron, the better. It will need to cool down enough to be able to touch, of course, but it will be easier to clean if you do it sooner rather than later. * Don’t leave water or liquid sitting in the skillet for long. It’s fine to soak your skillet with water for a few minutes, but cast iron isn’t the type of cookware that you want to fill with water and let soak in the sink for hours. * If your skillet is still warm or hot, use warm water to wash it rather than cold. Putting cold water into the hot skillet could potentially cause it to crack. Cast iron cookware is pretty sturdy, so this isn’t likely to be a problem unless you’re putting ice water straight into a really hot skillet, but just to be on the safe side, warm water is best. * The better-seasoned the skillet is to begin with, the less cleaning up you have to do. With a really well-seasoned skillet, you might only have to give it a quick wipe-down and call it good without needing to do any scrubbing at all. Seasoning builds up gradually over time as you continue to use the pan, so the absolute best scenario would be if you had a pan that was handed down from your grandmother or great-grandmother. Since that isn’t an option for many of us, the next-best option is to buy a good quality skillet and just keep using it often to build up those nice layers of seasoning. Sometimes you can find nice, old-fashioned cast iron skillets at antique stores. It’s hit or miss since it isn’t always easy to find ones that aren’t covered in rust, but if you can find one in good condition, the older vintage skillets are usually better quality and have a smoother surface than modern cast iron. The skillet in the picture is one I found at an antique flea market a couple of years ago. It has no markings on it except for the number 3 near the handle, and I don’t know enough about vintage cast iron to be able to date it accurately, but it’s a very well-seasoned pan, and I love it because it’s a smaller skillet that’s just the right size for re-heating food. Since it isn’t always easy to find a cast iron skillet at an antique store, this is a brand of cast iron cookware that’s a good-quality modern alternative. With a little bit of extra care, a cast iron skillet can be a sturdy, dependable item of cookware that will last for years. Thank you Lori! I am enjoying your site. I am curious to learn more healthy stuff and I am sure going to stick around. I am new to gluten and dairy free cooking especially bread making so any help with that would be much appreciated. Thanks again. Blessings. Fantastic tips. Cast iron skillet are harder for maintaining. My mom insists that cooking food in it is more delicious. It is true that you shouldn`t leave water to soak in it for too long. Best regards!